A 24-year-old university student is in police custody after he was arrested over a series of robberies in Nairobi’s CBD. Mercy Siambi claims to be a second year student at Kenyatta University was arrested after police found her with some electronic equipments believed to have been stolen from a shop in town. 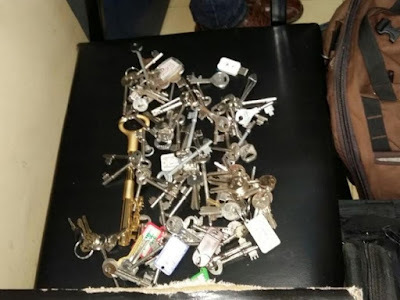 After searching her house at Santon, Kasarani, Police also found video cameras, laptop and a bunch of keys she uses to break into the stores. Mercy's brother Paul Agadi was also arrested a few hours before near City Hall Nairobi and a Ceska pistol found on him. He led the police at his sister's house where they found the stolen goods stuck up waiting to be sold to shopkeepers in the CBD. The two will be arraigned in court today to face charges of robbery with violence.